Defeat the Wrath of Sithis to be readmitted to the Dark Brotherhood. These quests are given to you should you break one of the Five Tenets in the Dark Brotherhood. The Wrath of Sithis will attack you in your sleep - you must defeat it to be allowed to be readmitted into the Dark Brotherhood. Notably, it is impossible to run from the thing; it seems to attack you in your dreams. As you might guess, it's impossible to obtain this quest after you initiate The Purification. There are three versions of the Wrath of Sithis, which are identical except for their health. All are similar to a Gloom Wraith, and share the Gloom Wraith's immunities to normal weapons, frost, and poison. They attack with spells (including Absorb Health and Frost Damage effects) and a unique Dagger of Discipline (Drain Health effect). Note that if you are due to level up, sleeping while any of these quests are active will not give you a level. The first time you break a tenet, you will be given the quest A Dark Exile. The weakest version of the Wrath of Sithis (health=215) is sent to attack you. When you defeat it, you are readmitted to the Dark Brotherhood. The second time you break a tenet, you will be given the quest Another Dark Exile. The intermediate version of the Wrath of Sithis (health=500) is sent to attack you. When you defeat it you are readmitted to the Dark Brotherhood. If you break a tenet a third time, you are given the quest Eternal Exile: you are permanently expelled from the Dark Brotherhood. 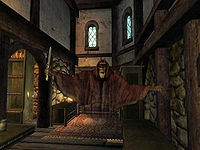 You must still defeat the Wrath of Sithis the next time you go to sleep (this time the strongest version, health=700) but there is no reward for defeating it, and you cannot rejoin the Dark Brotherhood. 10 I have been exiled from the Dark Brotherhood for breaking one of the Tenets. The next time I sleep, I will be visited by a spirit of vengeance known as the Wrath of Sithis. Only by defeating this spirit may I be allowed to rejoin the Dark Brotherhood. 100 Finishes quest I have slain the Wrath of Sithis, and am no longer exiled from the Dark Brotherhood. I may resume my duties as normal. 100 Finishes quest I have slain the Wrath of Sithis, and am no longer exiled from the Dark Brotherhood. I may resume my duties as normal. I should be wary, however, for this was my last chance at redemption. If I invoke the Wrath of Sithis again, I will be forever exiled, even if the spirit is slain. It is possible to use the console to advance through the quest by entering setstage DarkExile, DarkExile2, DarkExile3 stage, where stage is the number of the stage you wish to complete. It is not possible to un-complete (i.e. go back) quest stages. See SetStage for more information. Esta página foi modificada pela última vez à(s) 01h55min de 14 de dezembro de 2013.